With the advent of spring, my crafting focus always turns to fun Easter crafts. These sweet felt bunny pants treat bags will delight children of all ages, and they are a quick and easy sewing project, even for beginners. Let me show you how it’s done! I always have my eyes peeled for crafting inspiration. I pore over catalogs when they arrive in the mail and earmark the ideas that catch my eye. 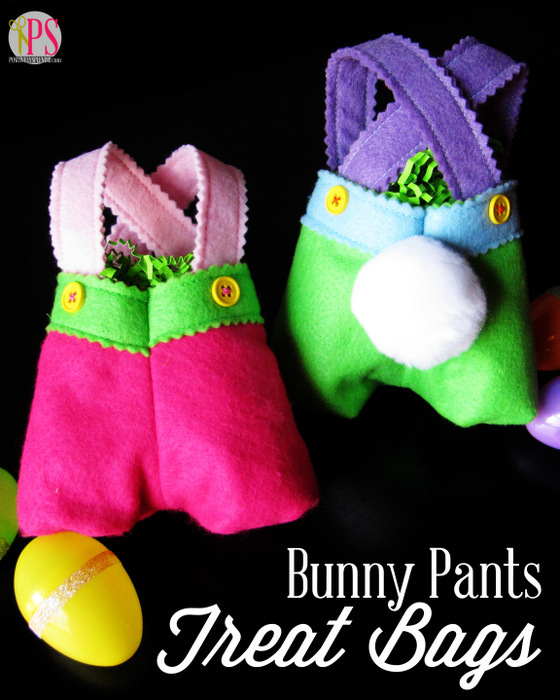 A couple of weeks ago when I was browsing my latest Lillian Vernon catalog, I came across some adorable little Easter bunny pants treat bags that I knew the kiddos would love. At close to $4 apiece (plus shipping! ), though, I knew it would be far more cost-effective to make my own. So I went ahead and came up with my own little method for doing just that! These little gems are an absolute breeze to put together. They will make a perfect addition to the kiddos’ Easter baskets, and the wheels are already turning in my mind over how to tweak the design to make Santa pants at Christmas! To begin, cut out all of your pieces using the template provided. You will need 2 pant body pieces, 2 belt pieces and 4 strap pieces. For a decorative touch, use pinking shears to cut out some or all of the pieces. Pin the belt pieces to the waist portion of the pant pieces; pin. Edgestitch around the belt pieces to attach them to the pant body pieces. Place the two pant body pieces together, right sides facing, aligning all raw edges. 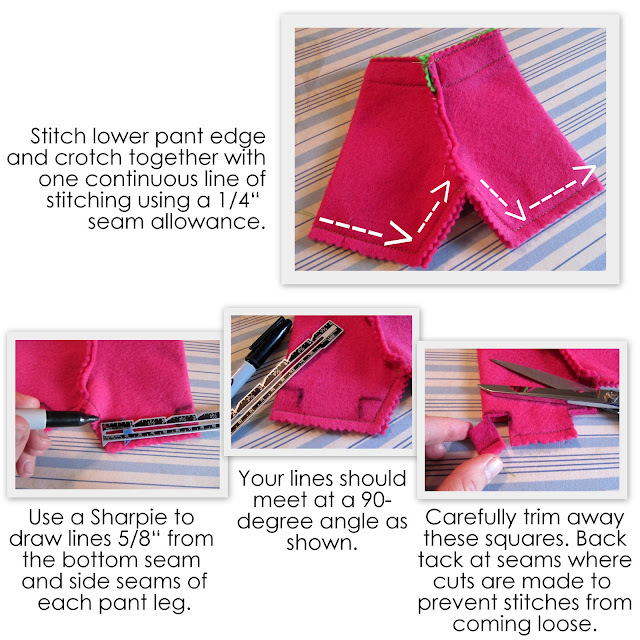 Stitch the pants together along the right and left curves (refer to the photos below) using a 1/4″ seam allowance. Fold the pants so that the seams you just sewed are aligned at the center, making sure the lower edges of the pant legs are precisely aligned. Pin. Using a 1/4″ seam allowance, stitch the lower pant edge closed with a continuous line of stitching, as shown. 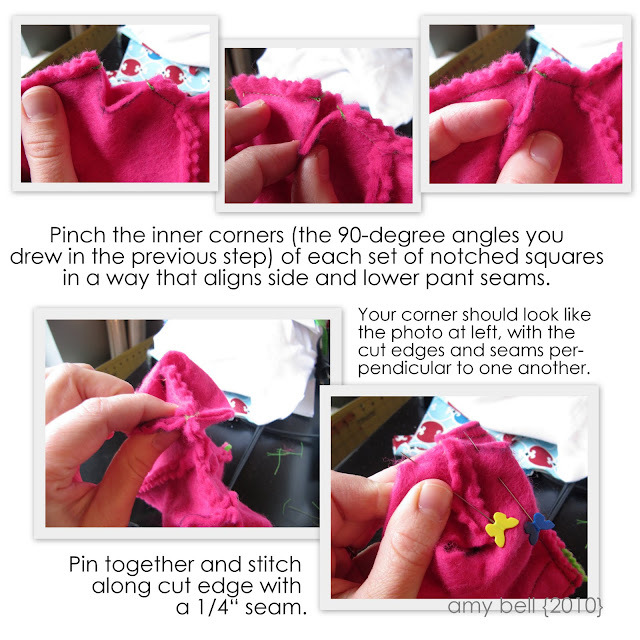 Use a Sharpie to draw lines 5/8″ from the bottom and side seams of each pant leg, as shown, so that the lines at each corner meet at a 90-degree angle. (Refer to the photos below.) Carefully trim away these squares, and then use a machine to stitch at the point in the seams where the cuts are made to prevent the stitching from coming loose. Pinch the inner corners of each set of notched squares together to align the side and lower pant seams. 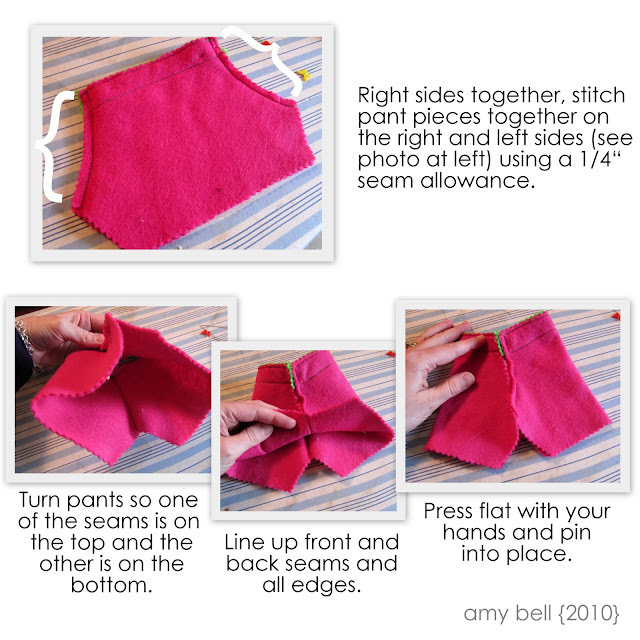 Pin and stitch along the cut edge with a 1/4″ seam. This will create a set of boxed corners on each pant leg. Pin the strap pieces in two sets of double layers; edgestitch around each set to secure them together. Affix the completed straps to the assembled pant body, as shown, with the strap edges extending about 3/4″ below the pant edges. Use either a needle and thread or hot glue to affix the straps to the pants. Embellish further with buttons and a pom-pom tail. So cute! I think I need to get a pair of pinking shears! Wow! They look so cute. That is a very good idea. You did a wonderful job. Thanks for sharing. LOVE those! So adorable. Thanks for posting a tutorial too! Blooming Where I am Planted! How cute! What a fun thing to make for Easter! These are so sweet…love the pompom tail! Awww…those little bags are adorable. Thanks for the idea. These are simply adorable!!! 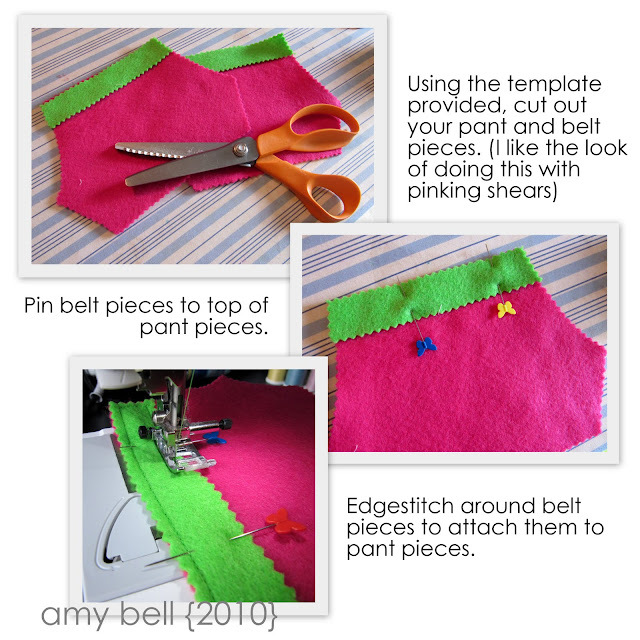 Thanks for linking @Creative Itch’s “Sew Cute Tuesday”!! These are absolutely darling. I will need to make 5!!! I better get hopping. Those are super cute! What a great idea! Just stopping by to say thanks for your nice comment! These little treat bags are adorable! So nice to meet new friends! Those are the cutest ever!!! Makes me want to celebrate Easter…we don’t have any cute animals associated with Passover! Its hard to make the 10 plagues fun or cute! That is seriously adorable and what a fun way to hide/display/show off the eggs. Oh.My.Goodness. Too stinking cute! Great tutorial! Also, I am now just itching to make a silhoutte wall hanging of my sons. I will be stalking him all week with the camera! Great project! wow I love these and i think they would translate great to santa pants for christmas thanks for the tutorial. These are so darn cute! I’d like to invite you to come plant your “creative seeds” at my new blog party on Fridays “Plant a Punkin Seed at Punkin Seed Productions”. Those are adorable! I love your pins. Oh my gosh, those are too cute!! Thanks for linking to CC!!! Oh my goodness…I love the one with the bunny tail! hehe My girls would love these! These are the most adorable things I have seen in a while!!!! I LOVE them!!!!! Those are the cutest bunny bags! Absolutely adorable!!! These are the cutest!! What a great idea! Thanks for sharing at Fun to Craft’s Spring has Sprung Party. Very cute! Thanks for sharing….I’ve posted a couple of links. Oh my word! These are just way too cute!!! Wow this is a wonderful treat for all of us! These are awesome! I wish I could sew!!! I finally got to make these this weekend for my 4 kiddos as an extra Easter gift. They turned out better than I could have expected! I LOVE when I can start and complete a project all in one day. 🙂 Thank you! Eeep! How CUTE are those little tails?!? Making this today with my 8 year old little boy. 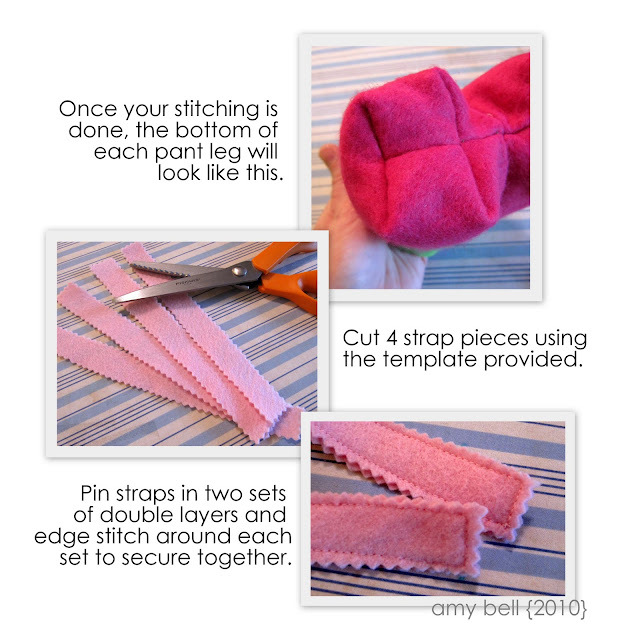 Just a note… the tutorial says to cut 4 straps but the pattern says cut 3. It looks like you do indeed need 4. Thanks for the heads-up, Kelly! That is a typo, and you do need 4 strap pieces.